The black bear is often called the Black Ghost as they move through the woods in stealth like silence often seen well before they are heard. It is a wonder how animals this large can move through the woods in virtual silence while a tiny little chipmunk sounds like a freight train on the forest floor. The bear sightings here seem to at an all-time high which leads me to believe that the bear population is very healthy this year. Most of the sightings are your typical see bear on road, bear runs off road while others are a little more unusual. Last week two of the guests here had unusual encounters; the first involved a group of fisherman who were preparing shore lunch on an island last week. Islands are usually great places for shore lunches as they typically have less bugs and usually void of wildlife to annoy you. The lunch itself went without incident and they went back to fishing but a short time later when they looked back at the island they had just left, there was a bear eating the fish carcasses they had left on the shore after cleaning their fish! Another group was in their boat fishing another lake when they heard some splashing in the water near them. They looked over to see a cow moose running into the water and swimming across the lake. The cow was followed by a calf and the calf was followed by a large bear. Adult moose are too big for a black bear to take down but the calves themselves are very vulnerable. Unless the adult moose is already down……..I encountered this bear feeding on a road kill moose the other day. It was feeding away as I drove by but once I turned around to take a picture, it backed off a little…… probably to see if I was going to steal his meal! That is a pretty big meal! All these sightings made me think of some of the more intense bear encounters Barb and I have had over the years. Barb is deathly afraid of bears and has only gone out hunting with me a few times. Most of her bear encounters are in her dreams. For more years than I can remember she has had repeated dreams where she attacked by bears. I wonder what a dream analyst would have to say about that. A few years ago we were in northern Wisconsin preparing a bear stand. As we were in the tree Barb thought she heard something in the brush. As we were sitting there in silence trying to decipher the noise we heard the distinct sound of a bear “popping” its jaws. Jaw popping is one of the tactics that bears use to try intimidate things (other bears, people, wolves……) out of a particular area. As we were sitting there, we never saw the bear but we could hear circling us popping away. I looked over at Barb and there were tears running down her cheeks! I felt so bad, I started making a lot of noise to scare it away. On another occasion I was helping another hunter track his bear through the brush. This particular bear had crossed a river twice and went into some of the densest brush I have ever seen. I had to get on my hands and knees and crawl into the brush to continue to track it. I was crawling through the brush looking for sign on the ground expecting to find a dead bear at the end of the trail but after about 20 yards I looked up and was face to face with a very alive bear at 10 feet! You have never seen someone back out of a brush hole as fast I did on that day! But by far my scariest encounter happened while hunting with my brother Bob several years ago in northern Wisconsin. I was hunting with my bow while he was just along for the experience. It was just before dark and we were in tree stand watching and had several smaller bears within the sight when the woods exploded when a huge bear ran into the area and scared all the other bears off. Bob and I looked at each other wide-eyed not believing what we had just saw and knowing that this is the dominate bear we had been waiting for. It was just before dark and I released an arrow when the bear presented a good shot. After the shot the bear ran off. After a few minutes it was completely dark and I climbed down the tree, flashlight in hand to find my arrow and see what kind of sign I could find. As I was searching the ground Bob yelled “Jim you better get back here, here it comes!” I ran back to the tree and scrambled back up as fast as I could. As soon as I reached the tree stand the bear charged the tree and pounded the ground with his front paws and let out a large “woof” noise. It was so dark at this point that Bob and I could not even see each other a foot away let alone an angry bear 10 feet below us. Terrified Bob and I sat in the tree discussing our next move while the bear sat below us “popping” its jaws. We decided to wait it out in the hopes that the bear would tire of this game and leave. We tried yelling at the bear, no luck. On two occasions he walked off a ways only to run back and charge the tree again pound the ground and woof. So there we sat in a tree in the dark with a pissed off bear a few feet below us. Bob had brought a pistol in case we needed it and it was becoming painfully apparent that we were going to need to use it. The problem was that although we could hear the bear we could not see it to make a good shot. 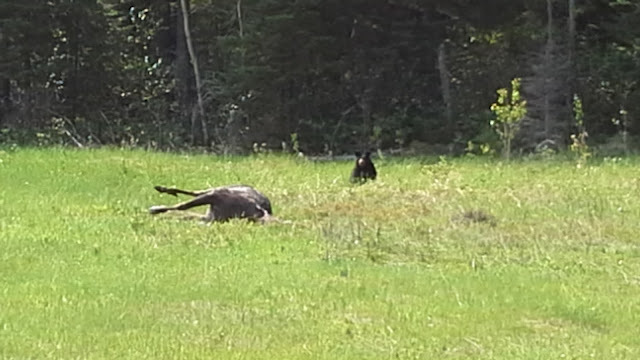 So instead of risking wounding the bear we decided to shoot into the ground near the bear. After all, no sensible bear would stick around with someone shooting at it right? Wrong……as soon as Bob shot into the ground the bear changed the tree and pounded the ground again! Resolved to the fact that we may be in the tree all night we sat back and waited for sunrise. 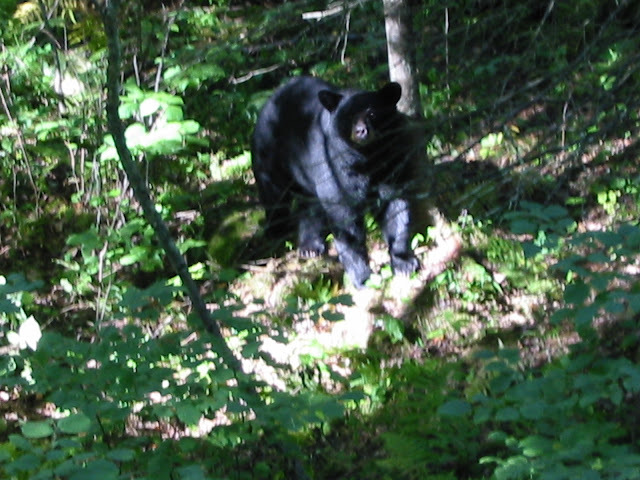 We could still hear the bear circling us in the brush, sometimes close, sometimes a short distance off. After about 2 hours we could hear him walk off and all went silent. Did he really leave or was he just waiting in the distance to see what we would do? After discussing our options we decided to get down out of the tree and head for the truck about ½ mile through the woods. I knew I could not outrun the bear but I knew I could outrun my brother if it came down to it! As soon as we hit the ground we started running. I had the only flashlight and I remember Bob saying that he could not see anything, so I ran with the flashlight pointed over my shoulder as we made our way through the woods. It was not until we were safe in the truck with the door closed that we felt safe. We sat there in the truck for a few minutes catching our breath and then started laughing and saying “Holy sh#t”. You would think that is the end of the story but I two days later I was back in the same tree stand (alone, go figure) when I saw a bear walking through the woods. The bear circled the area and then walked directly up to my tree and looked up at me! It was him! I had my video equipment with me and was able to get some footage of him. I started to question my decision to come back to this stand when he turned and offered me a shot. This time the arrow flew true and I breathed a sigh of relief. Morale of this story……if you are going to go bear hunting try to take someone you can outrun…..just in case. On the fishing front, good friend and former co-worker Rob came up for a few days this week. We got out several times and had very good fishing. Barb and I also made a video of our latest trip to Onaman which includes some of the best fishing we have had on this lake.